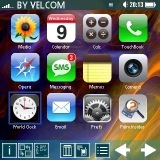 TouchLauncher, the application launcher that puts a Palm OS spin on the iPhone home screen, has recently been updated. Since its debut a few months ago, the app has quickly risen to become a best seller in the PIC software store and has seen a number of updates along the way. TouchLauncher basically functions as a more finger friendly interface with support for finger scrolling, drag and drop operations, custom iconsets, wallpapers, weblinks, contact icons and much more. The last couple of updates address some bugs, improve category and 5-way functions, improvements with high-res+ support and updated icons. You can checkout a video clip of TouchLauncher in action after the break. TouchLauncher v.1.1.5 is available now for devices running Palm OS 5 and higher including Palm PDAs (Palm TX, LifeDrive, T3, T5, Zire 72). The app comes with a free trial period and costs $6.99 to purchase. On the iPhone, I can use my finger to chnage a whole screen from left to right via a "swoosh"....using arrows instead of this feature is far from "iphonish-like". So you're saying this feature doesn't actually work: "Scroll with your finger. Change pages of applications in TL with your fingers! Tap an empty space on a page and drag it left or right to switch to the next page!"? OK, you got me beat! Thanx for the enlightenment. This looks like it's just asking for a C&D letter from Apple for using several of Apple's copyrighted and/or trademarked app icons. Not too bad. I ran it for about a week but found it a little slow and a possible bug that caused my 680's unlock screen to flicker. I pulled it and no more flicker. But in all honesty I'm not sure TL was causing it.